Groups which regularly use our buildings are listed below in day of the week order, starting with Sunday. Please click the sign next to the name to find out more about each activity. We meet in the Carter room and pray for those in our fellowship, for the service of worship that is about to take place and for issues and concerns going on in the community and the world. Family Worship. We have a Holy Communion service 1st Sunday of the month. P3 are our teens and young adults group who meet in the lounge and have a relaxed service. P3 stands for ‘ping pong praise’ and yes, ping pong does sometimes feature!. 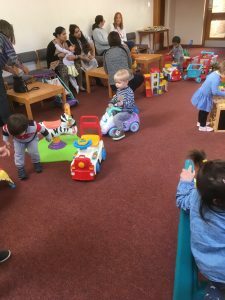 Every Tuesday during term time from 10.30am – 12pm. 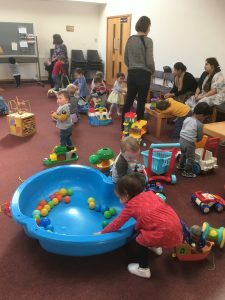 This group welcomes Parent/Carers and their children aged 0-4years old. 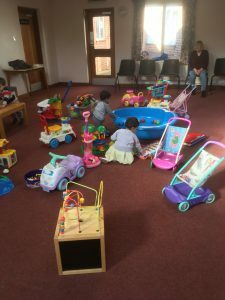 To make new friends over tea/coffee and biscuits, while their children play happily with the toys. Please phone Maria on 0206 467 8121. 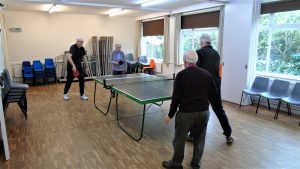 Although our club’s prime purpose is to provide an opportunity for slightly more mature folk to rekindle dormant and/or rusty table tennis skills, it has also developed into a very happy, friendly and mutually supportive group, where much chat (sometimes trivial and sometimes serious) goes on between games over cups of coffee. The current membership numbers about 12 and ranges in age from early 60s to nearly 90. We are always happy for anyone to drop in on a Wednesday morning – whether to see if they too have adequate hand-eye coordination to play a reasonable game or, if not, just for a cup of coffee whilst being entertained by watching others burning off a few calories. 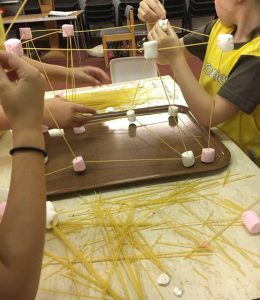 THE GIRLS’ BRIGADE (1st Petts Wood Company) Our fun programme on a Wednesday evening includes games, drama, craft, cooking, team building games plus extra activites during the year e.g. 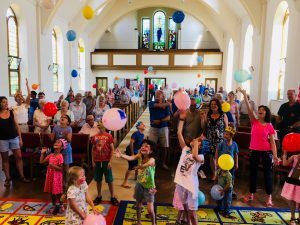 Ice Skating, summer outings, sports day and a weekend camp. 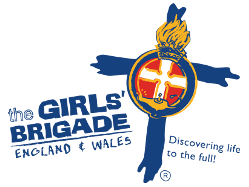 Girls’ Brigade’s aim is to help girls to become followers of the Lord Jesus Christ, and through self control, reverence and a sense of responsibility to find true enrichment of life. 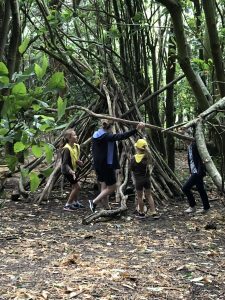 Explorers (aged 5-7 years) Wednesdays 5.30-6.30 p.m.
Juniors (aged 7-11 years) Wednesdays 6.00-7.30 p.m. Seniors (aged 11-14 years) Wednesdays 6.00-7.30 p.m.
Brigaders (aged 14+) Wednesdays 6.30-8.00 p.m.
All girls are invited to come and join the fun! lst Petts Wood Pack – Thursdays, 5.45 to 7.15 p.m.
8th Petts Wood Pack – Fridays, 6.30 to 7.45 p.m. 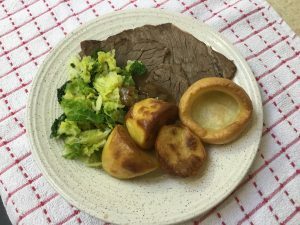 The lunch club was established in 1966 with the aim to provide a home cooked meal for elderly or lonely members of the community. It is not necessary to be a member of the church. 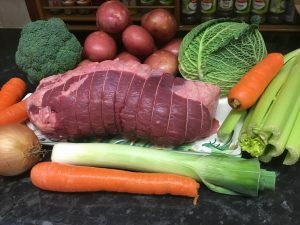 We can’t guarantee roast beef every week, we do like to ring the changes. Orchestra meet to practice on occasional Thursdays prior to leading the music during a Sunday morning worship. 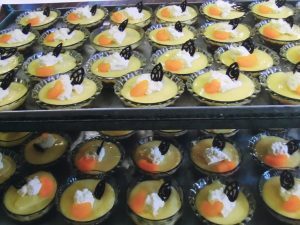 The orchestra provide a welcome new dimension to the music options at Christ Church and we promise we are not biased by the fact there are often cakes after the service when the Orchestra are playing! Badminton club meets in the Kingsbury Hall, new members welcome. New members of the choir always welcome. The choir rehearse on Thursday evenings and then contribute to Sunday morning worship. Coffee Stop meets in the lounge (except during August when they meet at the homes of some of the members) every Friday. A relaxed opportunity to chat and spend time with others over a hot beverage and some homemade cake.